When our economy grows, it doesn't grow equally for everyone. There are winners and losers — and for the past 35 years, capital has won and labor has lost. 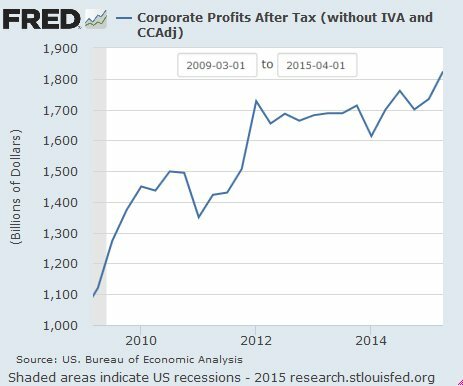 Since the stock market bottomed out on March 6, 2009 (during the Great Recession) corporate profits have soared (Source: St. Louis Federal Reserve). 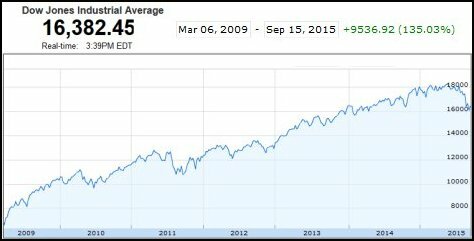 During that same period of time (from March 6, 2009 until today) stocks on the DOW are up over 135% (Source: Google Finance). Recently stocks have taken a hit because of concerns about China and the global economy (Translated to mean: Not enough people are earning adequate wages to purchase a sufficient amount of goods and services — also known as "supply-and-demand" in the economic system of capitalism). 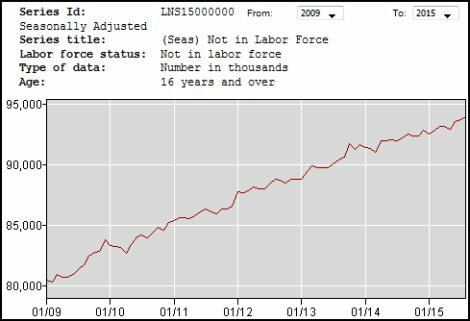 And since March 2009, we also have over 13 million more people "not in the labor force". Unlike the DOW, the number of jobs created didn't rise by 135% (Source: Bureau of Labor Statistics). 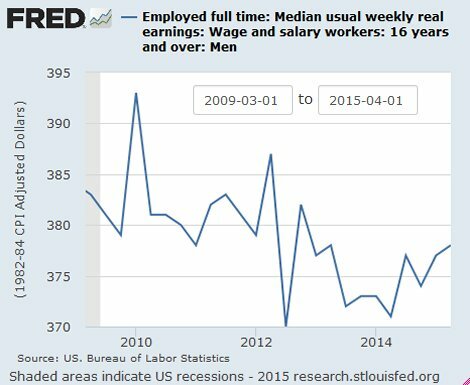 And also since March 2009, wages have declined. Unlike the DOW, wages didn't also rise 135% (Source: St. Louis Federal Reserve). On Sept. 16, 2015, Sen. Patty Murray (D-Wash.) and Rep. Robert C. “Bobby” Scott (D-Va.) introduced a billed titled Workplace Action for a Growing Economy (the WAGE Act), legislation to strengthen protections for workers who want to raise wages and improve workplace conditions. The WAGE Act would amend the National Labor Relations Act to help ensure workers are able to have a voice in the workplace and would crack down on employers who break the law when workers exercise their basic right to collective action. In a press conference announcing the legislation, Murray and Scott were joined by AFL-CIO President Richard Trumka and Ross Eisenbrey, Vice President of the Economic Policy Institute. But yet the Republicans are still claiming that if we cut taxes, that will create more jobs and raise wages — but a boatload of evidence over the past 35 years shows that this is not the case. The "extra cash" saved in tax cuts for the very rich and big corporations usually goes into the pockets of these "job creators" — those who don't necessarily create jobs here, (unless they use H-1B visas), but in other countries with lower wages; and /or the "extra cash" is hoarded in offshore tax havens (to avoid taxes); and/or is used to buy back their own stocks (to increase stock prices and executive pay); and/or is used to buy other companies through mergers and acquisitions (and not necessarily competing businesses). When multi-billionaire Donald Trump was asked in a CBC interview how felt about the fact that the average American CEO makes 350 times what the average American worker makes, he said most CEOs get the pay they do because they install their friends on their boards of directors, who in turn give the executives "whatever they want because the friends love sitting on the boards." Trump asserted that only 10 percent of the boards of America's public companies exercise what he believes is the required independent judgment when they set executive compensation: "So that's the system we have, and it is disgraceful. You see those guys making these enormous amounts of money. It is a total and complete joke." Last year in a comprehensive 40-page white paper entitled "Understanding the CEO Pay Debate", Roosevelt Institute researchers Susan Holmberg and Michael Umbrecht flagged the same quid pro quo culture Trump mentioned: "There is strong evidence that companies with higher CEO pay compensate their board members more generously, an indication that board members are engaged in a corporate liaison with CEOs rather than serving as independent parties that can assess the appropriate award for the CEO's performance." In Trump's Face the Nation appearance, he also said "the hedge fund guys" need to have their taxes raised. Under the existing tax code, hedge fund profits are taxed at a significantly lower tax rate than traditional wage income. Those earnings are not taxed at the same rate as other income (such as regular hourly wages and base salaries). Instead, they are taxed as "carried interest" — just like the profits made on investments called "capital gains". This generally means the federal government collects no more than 23.8% from hedge fund managers (or from "private equity" investors like Mitt Romney) who use the "carried interest" loophole, just like investors who pay the same tax rate on profits they receive from selling appreciated stocks and bonds — or from the sale of real estate investments (like Trump, or those who own multiple beachfront mansions). Last month multi-billionaire Warren Buffett (the 2nd richest person in the U.S. behind Bill Gates, and a staunch supporter of the "moderate" Democrat Hillary Clinton) also called for an end to the tax advantage hedge funds get from the carried interest provision. And Jeb Bush has also come out in favor of abolishing the carried interest provision — but just like other Republicans who want to lower the capital gains tax rate (or eliminate the capital gains tax completely), in Jeb's tax plan he lowers this tax rate from 23.8% to 20%. The capital gains tax rate on investments in stocks, real estate, fine art, gold (and other precious metals), diamonds (and other precious stones) and wine collections (etc) used to be over 39% before Jimmy Carter lowered it to 28% in 1979. Reagan lowered the rate on capital gains to 20% (but later back to 28%). Clinton lowered it back to 20%, and George W. Bush lowered it to 15% — almost to the lowest level since this tax was first initiated at 12.5% in 1921). The top tax rate on people who earn regular wages is currently 39.6% — about what the capital gains tax rate used to be in 1979, which is now 23.8% — and the Republicans and billionaires wants this tax rate lower — and are willing to forego the "carried interest loophole" by throwing some hedge fund mangers under the bus to achieve this. (It's all BS folks!) The carried interest loophole SHOULD be eliminated, but the tax on capital gains should also be much higher, not lower. By throwing the very unpopular hedge fund mangers under the bus, others in their income class (and the super-duper rich like Warren Buffett) may be using "bait and switch" to distract us from the very low tax rate on capital gains. But why is capital taxed so much lower than labor? Some argue that it's because of the "risk" investors take; but people driving to work "risk" their lives every day. And it's not always a "risk" that investors take, but many times just a "gamble" — and not always with their own cash. In the case of George Soros, who bet $1 billion shorting the British pound, that was also money he could afford to lose, so not so much a "risk" per se because most of us wouldn't do that with our rent money. For the super-duper rich, it's just like a "game" of Monopoly for them. Many of these people make tons of cash gambling with other people's money (like hedge fund and private equity mangers), and then pay a low tax rate on their "commissions" — but income is income, and besides: investors will always "risk" their cash to make ANY return at all on their investment, so long as it beats inflation. Many times they have no place to "park" their money, and just buy U.S. Treasury bonds, which yields a low rate of interest, but is also one of the safest investments in the world (more below on the subject of quantitative easing). Most of the billionaires make most of their wealth with capital gains, not carried interest — so just going after the "carried interest tax loophole" (and not capital gains) is mostly only a symbolic and misleading gesture. Just by closing the carried interest loophole amounts to chump change when compared to the capital gains tax loophole. Donald Trump, Warrren Buffett and Jeb Bush (who say they want to abolish the carried interest loophole) also want to lower the "statutory" corporate tax rate, even though most corporations already only pay about half this as their actual "effective" corporate tax rate. So lowering the corporate tax rate will only provide an increase in revenue stream into the pockets of CEOs and other executive board members (who vote to pay themselves) — and who will pay a capital gains tax on stock options, whose value is increased when their companies use their profits to buy back their outstanding shares of stock (which is also mentioned in the Roosevelt study). Corporations already have over $2 trillion in profits stashed overseas untaxed by the U.S. government. They have NOT created jobs or raised wages in America. If anything, they've only offhored more jobs to lower wage countries. What they do is buy back their stocks, pay dividends to their investors, then pay themselves enormous salaries. Not to mention, they have spent billions of dollars every year buying out other companies (not raising wages and creating jobs, but usually laying off workers after a merger — a.k.a. "reorganization"). No matter how much profits companies report (or how little they pay in taxes) it usually never translates into more domestic investment, more jobs being created or higher wages. When the "economy" grows, it's usually just good news for Wall Street, not workers — except for maybe, there won't be as many layoffs. Oops!!! On September 15, 2015 Hewlett-Packard just announced they're going to ax another 25,000 to 30,000 jobs. That's after the current GOP presidential contender Carly Fiorina, the former CEO of HP, had already axed 30,000 jobs by offshorng them to China. New York Times: "The Fed highlighted the improving state of the American economy as the job market continues to rebound [not true at all]. But the outlook — particularly deepening concerns that China’s economic slowdown could weigh on the continuing recovery in the United States — prompted the Fed to keep interest rates at ultra-low levels [near 0%]. The Fed’s decision weighed on global markets Friday, and Wall Street opened lower as well after edging down modestly the day before." Some debates includes those who favor keeping the interest rate low until we get to "full employment" and wages rise. But we've been near 0% since the Great Recession and that hasn't happened. Millions have dropped out of the labor force and wages are still down. Inflation has been running below the Fed’s target for years—and its recent moves have been down, not up. This subdued price inflation is not a puzzle; it’s the outcome of a labor market that remains so slack that nominal wage growth is running about half as fast as a healthy recovery would be churning out. Some people argue that it's primarily the very rich (the asset class) who mostly benefits from the Fed's low interest rates. Here's a recent article with some interesting reader comments about the Fed's decision not to raise interest rates. Since November 2008, the Fed has pumped roughly $3 trillion into the economy, and two-thirds of it is sitting in the Federal System earning interest for big banks. The majority of the funds created by QE are gathering dust in the Federal Reserve System as excess reserves over and above what commercial banks are required to hold to protect against loan defaults. Excess Reserves of Depository Institutions have exploded from $267 billion in October 2008 to $2.2 trillion in September 2013. Banks aren’t willing to lend the money out or because there simply isn’t the demand for the loans that could be created. Either way, the banks don’t have to lend excess reserves to realize a return because the Federal Reserve pays 0.25% interest on them. "I can only say: I'm sorry, America. As a former Federal Reserve official, I was responsible for executing the centerpiece program of the Fed's first plunge into the bond-buying experiment known as quantitative easing. The central bank continues to spin QE as a tool for helping Main Street. But I've come to recognize the program for what it really is: the greatest backdoor Wall Street bailout of all time." Free cash to the big banks (QE) and tax cuts for the super-duper rich and large multi-national corporations don't automatically create jobs; but increasing the tax rate on capital gains to invest in infrastructure would. And "growth" in the stock market (and/or an increase in untaxed corporate profits) doesn't automatically raise wages; but raising the minimum wage to a "living wage" to create more "demand" in consumer spending would certainly help. But most people already know this, including the "job creators". But then again, that's the whole point, isn't it? Brookings Institute: "The typical male U.S. worker earned less in 2014 than in 1973. The typical man with a full-time job — the one at the statistical middle of the middle — earned $50,383 last year, the Census Bureau reported this week." "50 percent of wage earners had net compensation less than or equal to the median wage, which is estimated to be $28,031." There are a number of influential politicians who feel the only functions of a central government are the military, policing, and subsidies to business and industry. A big cause of the fall in wages is the massive loss of government jobs at all levels and as they fall and the services get worse then denounce government for poor service. As nation we seem to have an aversion to government except as a coercive force, we are rapidly becoming just a country and not a nation. The GOP also wants less regulation..
Less regulation would mean less auto and safety recalls; less people to clean up oil spills; less people to oversee food and drug safety; less people in inspect containers at ports and airports; less people to audit tax dodgers; less people to monitor safety conditions at work places; less people to inspect bridges, roads and railways; less first-responders at FEMA; less regulators at the SEC; less people overseeing medical and old-age facilities; less building inspectors; less people fighting wildfires in the northwest; less air traffic controllers; less inspectors investigating plane crashes; less government research; less people at the EPA testing the air and water (etc.) — and probably less people at the DMV processing driver license renewals. They want less regulation and less government. They want the wild west all over again, where anything and everything goes, with no law and order. They want anarchy. With a growing population, we don't need LESS government workers, we need MORE government workers. But there is also lot a fraud in government (like bank regulators), so we also need BETTER government. Which means, we'll also need more oversight of government workers, which means, hiring more government workers! Democrates have increased taxes on the rich twice since they got control. Once in the ACA and once in that 'stop a tax increase bill'. Your complaining that things aren't good. Maybe those tax increases caused it? My tax return said retire so I did. Neill is WRONG, WRONG, WRONG. I have no idea what you're talking about. The last time the Democrats were in "control" was before the 2010 mid-term elections. Then in December 2010 Obama extended the Bush tax cuts for two more years (when it was still 15% on capital gains under Bush). The Bush tax cuts were originally set to expire (by Republicans) at the end on 2010 --- but they were extended throughout 2011 and 2012 by Obama. The payroll tax holiday was enacted in 2011, which reduced the employee share of the Social Security payroll tax from 6.2 percent to 4.2 percent. It was only meant to be temporary to help working people in the post-recession. The payroll tax cuts (like the Bush tax cuts) were not renewed when they expired at the end of 2012. Obamacare (which passed in 2010), included a meager 3.8% surtax on capital gains (to expand Medicaid), and didn't even go into effect until 2013 --- when the tax rate on capital gains went back from 15% to 20% --- adding 3.8% to make the tax rate 23.8% on capital gains. The capital gains tax used to be near 40% before Jimmy Carter lowered it 28%. Reagan lowered it to 20%, then back to 28%. Clinton lowered it to 20%. Bush lowered it to 15%. Under Obama, after extending it 2 years, then went back to 20% --- with the 3.8% surtax added. Compare the current 23.8% tax rate on capital gains to the top margin tax rate on regular wages (labor) at 39.6% + 7.65% Social Security tax on income up to $118,500 (There's no Social Security tax on capital gains income). Bill O'Reilly once said if Obama raised his taxes, he couldn't afford to work any longer and would retire too (just like you) --- but Bill O'Reilly is still on Fox News five nights a week. Wrong except that being right thing. I said they put up taxes in the ACA and they did. They added the 3.8% even you mention. I said they raised again later that included the 39.65 income bracket and the 20% capital gains tax rate. You can't compare 39.6% + 7.65% to 23.8%. First your numbers are wrong. It would have to be 39.6% + 1.45%*2 + 0.9% (more obamacare). That's 39.6% + 3.8%. Next your ignoring the fact that capital gains are not indexed for inflation so you pay that tax on gains that aren't real. So the rate on real gains is much higher. Next of course you neglect that retained earnings of corporations are taxed at a marginal rate of 35%. Hey Obama got tax increases. Now you say stuff isn't good. You want more increases. I looked at my tax return and quit working. Those were the Bush tax cuts expiring...after Obama extended them for two years. ...And that rate is for capital gains realized after 1 year --- the rate was lower if assets were held longer before being sold. A funny thing happened in 2013. Despite the howls of Republicans that raising taxes on their wealthy owners would bring about economic disaster Obama allowed taxes to rise to pre-Bush levels on the top 0.7% of taxpayers. Twenty years earlier Republicans had predicted the same economic disaster when Clinton raised taxes on this wealthy group. The result as you should remember was the longest peacetime non-inflationary economic growth period in 100 years. An average of 229,000 jobs was created over these 8 years culminating in a balanced budget. A few months later despite howls of Democrats that cutting government spending would bring about economic disaster the sequester was allowed to happen. The result of these two actions as you should remember was an increase in the GDP from the previous quarter and continued economic growth. Thus it can be inferred that rather than one side is right and the other is wrong that indeed both sides can be wrong simultaneously and no one admit it. Fed raising rates kills wages. Taxes will just get stolen. The Fed is about to dump water on the economy to prevent "inflation". What they really mean is "wage inflation". The funny thing about people who gripe about stagnant wages is that they aren't smart enough to fight to keep interest rates low long enough to raise wages. They fight for tax increases, which will be stolen by contractors and won't create jobs. They fight for minimum wages, which doesn't prevent illegals, outsourcing, insourcing, etc. from removing the job market from minimum wage requirements. But they never, ever, ever, enter the discussion when everyone on every national business news program in the world is fighting to raise interest rates so that not enough jobs are created to raise wages. Why do you think that is? Maybe it's because they don't get a piece of the action when people actually have a job. Data indicates that from 1955 to 2006 we grew at 3.5%. then OPEC hit and Japan began the rise of East Asia. and the Weather Channel sell fear and unrest.